Freshwater Farms of Ohio will host an early Halloween celebration for all ages, October 19 and 20, with live music, food, a bonfire, wagon rides, a spooky adventure and more. Halloween Bash is the final edition of this year’s Concert Series at the farm, 2624 N. U.S. Route 68, a mile north of Urbana. Festivities are planned 4 to 10 p.m. both days, and costumes are optional, though costume contests are planned for kids and adults. Live music will be offered on the outdoor stage, 6-8 p.m. Friday by the Hedgehog String Band of Bob Lucas, his daughter, Chloe Manor, and her husband, Chris Westhoffon, and Saturday by the Columbus folk-rock-blues band Devil Doves. 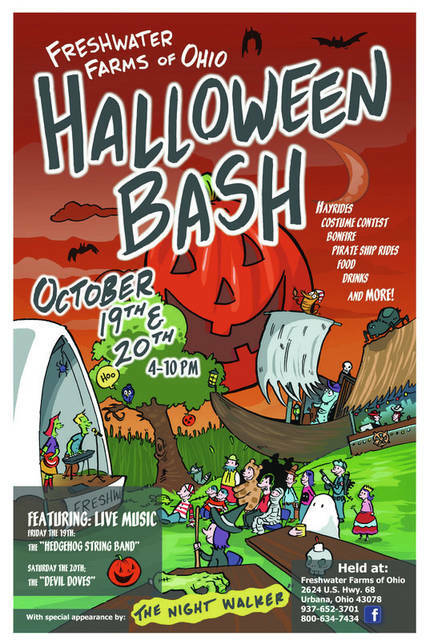 Admission each night is $5 at the gate, or online at https://fwfarms.com/product/2018-halloween-bash/.